On Saturday 25th May. Agria will be uniting dog lovers across Europe for the Agria Dog Walk. Agria Dog Walks will take place across the UK, as well as in Sweden, Norway, Denmark, Finland and France – with thousands of feet and paws walking together, with the aim of making a difference to dogs’ lives by supporting the great work that teams like GSRE do. GSRE is one of the specially selected rehoming organisations chosen to take part and receive a donation of up to £2,500! 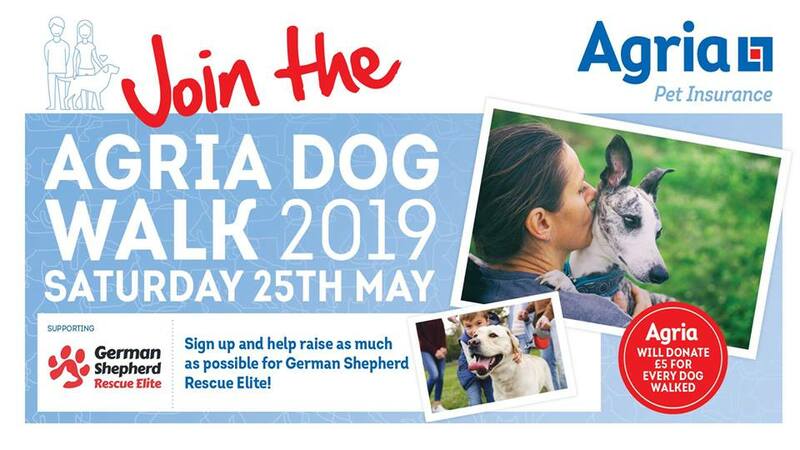 Agria Pet Insurance will donate £5 for every dog walked, up to £2500 – the more dogs in our Agria Dog Walk, the greater the donation! Walking offers significant physical and mental health benefits for people AND for dogs! Walks are being arranged at numerous locations. Many are being organised by regular walk groups and some have been arranged specifically for the Agria Dog Walk. See below for a walk close to you and then please register your attendance using the Sign Up Here link. Angie & Pippa will be doing their annual sponsored walk on this day as well so please support them! Please note that the walk groups are set up by GSD lovers and are not governed by, or the responsibility of, or liability of German Shepherd Rescue Elite.